Daily life in the Ghost Town of Leetonia. The mountains girls view and record the present and uncover the past. This morning I went out to get another picture of the four crowded barn swallows. As soon as they saw the camera they flew off. One landed a short distance away on the fence and I took this picture. As far as I know this is there first flight. Their parents were a little upset at my disruption of the nest, but knowing these swallows they will be back up near the nest tonight. It has to feel good to be out of such tight quarters. Several of the other nests have young ones fully flying this morning. I am hoping that means an increase in bug removal. Mountain girl, Paula, logging off and trying to behave. Sorry about the blurry picture, but you get the idea. These four barn swallows under our back porch are struggle to find enough room in their nest. Seems mom and dad didn't plan on 4 youngsters surviving and it won't be long until one of them has to leave. They were all preening and stretching their wings out this morning, while I ate breakfast. Mom and Dad have a full time job finding enough bugs to keep the youngsters satisfied. I am pretty sure this is the only kind of over crowding Leetonia will experience in the near future and one that keeps us very entertained. Mountain girl, Paula, logging out. Before you all email me about dog cruelty, I must make a fast explanation. Yesterday, Leo, Scooter, Michelle(Lee's Sister) and myself were taking a walk up the hill on the way back both dogs ran up the hill after what I thought was a rabbit. I called them and Scooter came out. Leo was slower to appear and when he did, he had a face full of quills, mostly inside his mouth. In the past Leo has never grabbed porcupines, but for whatever reason we were left with a decision. A $300 emergency trip to the vet or an attempt to pull them out ourselves. 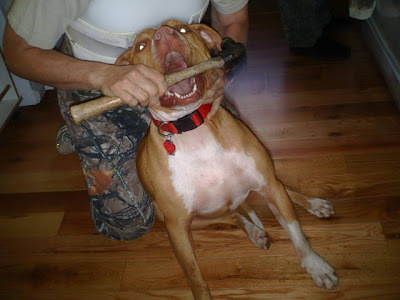 Outside the mouth isn't hard, since you can muzzle a dog and not get bit, but inside is another story. I noticed the wood handle hammer and came up with a solution. If the dog had something in his mouth that kept it open and didn't allow him to bite us we might have a chance. Well, it worked we pulled several hundred small quills out of the inside of his mouth without incident. Now I am telling you Leo was very cooperative. If he had struggled much we would have never been able to do this. My holding ability is very limited and he listens to me the best. He agreed to pose today as a short reenactment for you all and received a food reward for his embarrassment. I used to be a dog trainer and vet assistant and am very used to handling stubborn dogs. I do not recommend this to anyone not willing to be bit in the process of trying to help. Leo was a good patient. He could leave a serious wound to anyone if in enough pain. The next day he got checked over by the vet and got some antibiotics for any infection at a much reduced cost then an emergency visit. Never a dull moment when you live in the woods. The porcupines have cost me thousands of dollars of damage to my construction equipment, vehicles and dogs since we have lived here the last 6 years. They are part of the cost of living in paradise. Mountain girl, Paula, Logging out! This made me laugh so much I had to share it with you. Stanley and Charlotte's son, Matt had a motorcycle accident and they decided to use this old wheelchair while he was there recovering. Well, the front wheel was broke so you would naturally try to buy one right? 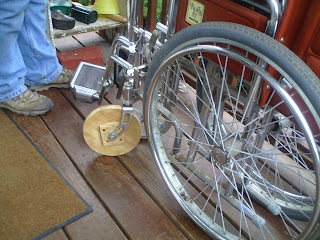 Not in Cedar Run; we make our own wheels. Who cares if they are wooden. I have to give Stanley credit, looks pretty round. The feet in the picture belong to Lee; she wanted to make sure you all knew. On the healing front I am getting better each day, which means I don't want to be in this thing that keeps me still. I have another 7 weeks imprisonment until my next check up and I am trying to find ways to remain sane. Getting all of your cards of support is a welcome relief to my misery and I appreciate all of you. Enjoy the wooden wheel. Mountain girl, Paula, logging out! 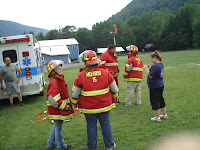 I want to dedicate this blog to the volunteers of the Morris Fire Company, the Medivac Flight Crew, The DCNR Foresty Dept, Mick's Son who found me, and everyone at the Cedar Run Inn who helped in so many ways. I am hoping the first picture has most of the Morris Fire fighters who came and wrapped me up like a fragile egg for shipment. They transported me as carefully as they could across roads most people would never want to travel and got me safely to the helicopter. Knowing someone else is in charge of helping you when you become unable is a feeling hard to relay. I am a very independent and strong person, so needing help is very foreign to me. I will have to say this experience is very life-changing and special thanks to the Morris People for all they did. 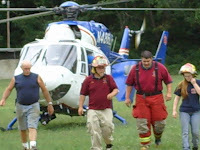 Next the Lifeflight nurse and pilot. Although no in flight movie was available, the morphine drip was greatly appreciated. They were great at keeping you calm about riding in a very tight space whirling through the air. They don't have much room in the copter to do everything they do, but having that shortcut to a state of the art hospital was a big relief. 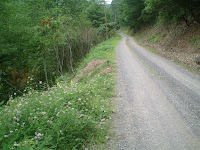 It would have been very painful to have been driven much farther on rough roads. Thanks for the smooth delivery to Giesinger in Danville. Also much thanks to Brian Caldwell the Chief Ranger at the Foresty Department. Not only has he personally come to visit, but he crawled down to my vehicle and retrieve many of my tools and dropped them off at my house. Wow! I can't say enough for the kind actions of all in this department. 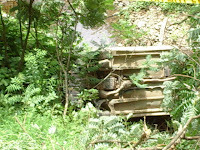 He continues to email me and is promising some pictures he took of the crash site. Thanks to Micks sons for picking me up. I will have to tell you I recognized your face but didn't realize who you were until later. I am so glad you came down the road when you did and helped me to safety. Last but not least Charlotte and Stanely Dudkin and Cozette Stolfus at Cedar Run. Just seeing their faces and knowing they would take care of contacting Lee and the emergency assistance was a relief. Charlotte's son Matt had just been in a motorcycle accident the day before and she was sick and still cared for me like her own daughter. Make sure you all support the Inn they are great people. Special thanks to Cozette who is a retired nurse and made sure I was comforted her light kiss on my forehead said it all and I will never forget her compassion. So many of my readers and friends of the family have sent cards and words of encouragement that I would be hard pressed to name you all. You know who you are and I am sure you got extra credit on God's report card. Now to the second picture. My granddaughter Reilly, 12, recently had a birthday, she helped her mom make up this Mountain Monkey equipped with a helmet and parachute to avoid any more accidents. Reilly's birthday was June 24th. I sent her birthday money and she returned it to me with a note, saying she felt God wanted me to have the money because I needed it more than her. Where does a child this age get this kind of compassion and self-less ness. It made me cry and be full of pride for the the wonderful person she is growing into. In this world it is the little things we do for each other that makes life worth the trip. We all complain about the gas prices, economy and so much more. But when it comes down to it we are all linked together in our struggles and our joys. Sharing this with you all has been a great blessing to me and I hope will be a blessing for you all as well. Pass on the love and compasssion to others everyday and you will make an impact if only for a minute on someone else. Thanks again for all the love and support. Thought you might like to see my new outfit for the next three months. I can walk around fine, which is a great relief. I am so glad I didn't break a leg. I am able to take the brace off when I sleep, which is good because it gets hot and itchy underneath. I am going to see the Doctor on Friday to get a better idea of how long I will be trapped in this thing. Mountain girls, don't make good patients. I love to be active and this is really testing my patience. Thanks for all the cards, flowers and other support you have sent me it is appreciated more than I can say. Who knows maybe I won't miss the whole season stuck in this turtle shell. Mountain girl, Paula, logging out. Well, I asked myself how did I run off the road and this is my conclusion. 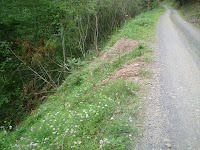 The first picture shows the Crown vetch covering the place where the road narrows. I was on the left and as I came out of this area the shoulder was soft and immediately threw my car down the hill. The road is about 10 foot wider right before this spot and I misjudged until it was too late. After driving in horrible conditions on this road it seems a strange fate to go over on a nice day. The rest of the pictures are ones the insurance company made of my vehicle. It held up really well considering the fall. And I am impressed with the fact it didn't crush. I climbed out of the drivers side rear window. gets better I will try to post more updates. On a non-accident note. ..The eagle pair at Cedar Run have near ready to fly youngster. After returning from the hospital, I was blessed with being able to see it flap its wings in practice to leave the nest. I will be anxious to flap my wings long before I am able to fly again, but living up here and receiving all of your support is truly a gift. Mountain girl, Paula, Logging off. Well friends I have had a major adjustment to my life. I suffered a major car accident Sunday June 29th. My car fell off a 100' cliff and landed in the creek. I was in a spot unable to get cell reception and invisible from the back road I traveled. I knew I had hurt my back, but also realized unless I left the vehicle I may never be found. I was able to get my seat pried down and climbed out the back window. 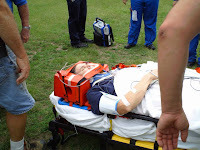 As my left hand touched the ground I realized I had broken the shoulder and had no strength. I had to lower myself on one arm down to the creek bed. "Thank God for all the pushups!" At this moment a truck passed by I yelled and waved, but they were unable to see me. Now I faced a climb up the side of the mountain. Every step set excruciating pain up my back. The bank was about a 50 degree angle. I got on my hands and knees and looked for anything to grab with my right hand since this was all I had to pull myself up with. I just prayed every root would hold and when I got to the last 10 feet, I didn't slid back down. We don't get much traffic on our road, but since it was a Sunday and many people were leaving their camps someone came shortly and I was able to connect to the assistance I needed. 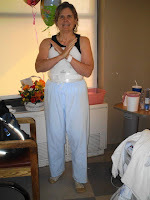 Here is the first picture of me trussed up before my air flight. 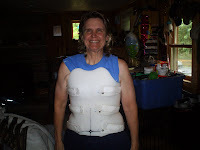 Two of my vertebra are broken one in 4 places the other in one. I also broke my left shoulder blade. I am just asking for all of your prayers making it through rehab and the financial stress will be my biggest challenge. I will try to keep you all updated in the blog. I am having a hard time looking at anything for any length of time because of nausea. Mountain girl, Paula, still loving Leetonia and logging out!